In this episode you'll hear from Steven P. Cohen. Steve’s latest book is entitled The Practical Negotiator: How to Argue Your Point, Plead Your Case, and Prevail in Any Situation. It’s not your typical business book, actually. It’s more of a Q&A format, covering a wide range of topics, related to work and to home, from a guy who knows his stuff about negotiation. 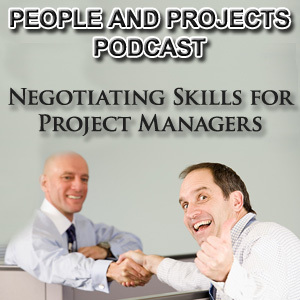 You’ll hear Steve talk about some important negotiation principles and then get his coaching on some situations that are quite close to home for many project managers. Learn more about Steve and The Practical Negotiator: How to Argue Your Point, Plead Your Case, and Prevail in Any Situation by visiting the book's website at http://www.practicalnegotiator.com/. NERVES by Kevin MacLeod (Incompetech.com) is licensed under creative Commons by Attribution 3.0. A THOUGHT by Podington Bear is licensed under a Attribution-NonCommercial 3.0 International License. COVERT AFFAIR by Kevin MacLeod (Incompetech.com) is licensed under creative Commons by Attribution 3.0.